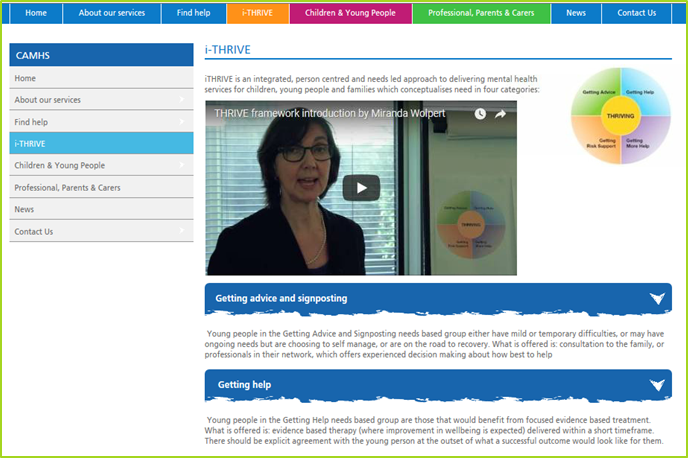 The i-THRIVE in NELFT team caught up with Taiye Aro, Head of Marketing & Digital at North East London Foundation Trust (NELFT) to find out more about the development of their new young people focused website. What problem were you trying to solve with the website? Do we have a website that really meets the needs of young people? Does it convey information in an easy and understandable way? Does our communication reduce young people’s fears when it comes to mental health, and going to a health service? Is the way we communicate digitally engaging? Would you say your digital communication with young people was a gap? There was a gap in terms of how the information was presented and having somewhere young people would go to. There is information on the NELFT website, but nothing that was a standalone area where young people could go and really access information. How did you go about addressing that? We did a number of things. Once it was decided that we wanted to create a website, we reached out to the service leads. We needed to get to get their thoughts and feelings about this which we did via a series of meetings. The second, and most important part, was to engage with young people themselves, especially service users. We wanted to make sure that this website was co-created, co-designed and co-produced. 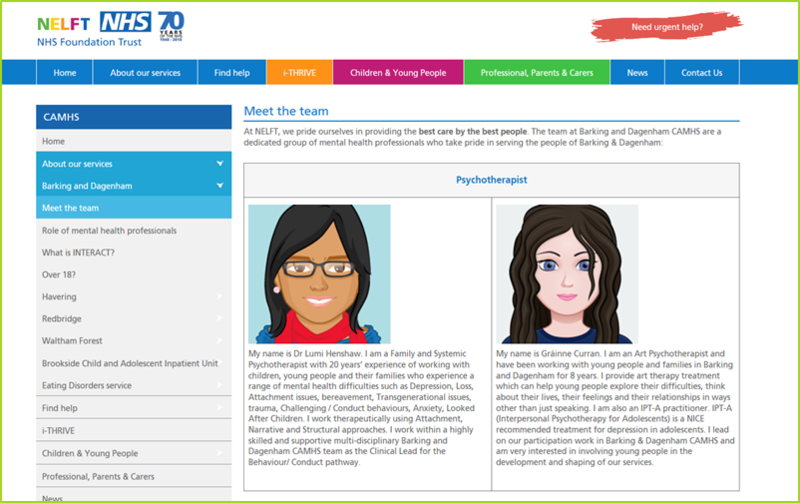 We did that by visiting young people and service users, through the patient experience groups throughout the different localities’ Child and Adolescent Mental Health Service’s (CAMHS). Finally, I presented our plans for the website at a series of CAMHS stakeholder events, made up of teachers, charity sector, local authority and NHS organisations, across Barking & Dagenham, Havering and Redbridge. Their feedback was also taken in account. How many groups did you visit? I visited two. One was in Barking and Dagenham and the other was in Redbridge. The young people were passionate about this project and were keen to share their thoughts and views about what the website would look like. They had a chance to see some initial design concepts and were able to provide feedback on them. It was a really useful experience in terms of getting young people’s ideas and putting those into reality. Some of their suggestions included; more colour on the website, videos, and to put a face to the services, clinicians and staff that they would be meeting with. They really liked the idea of having avatars and staff profiles as well, so they could get an idea of who they would be potentially interacting with in the service. All the things they brought forward we implemented on the website, and as time progresses I’m sure we will continue that dialogue and figure out how, together, we can take the website to the next level. So, you had this gap regarding your web content not being accessible for young people, you’ve done lots of consultation around it and young people have fed into the design. What were the results? How does it now meet that need that wasn’t being met before? From an aesthetic point of view, the initial designs were still very NHS-like, lots of white and maybe a little bland upon reflection. The young people made it known that they wanted something that was vibrant, colourful, really engaging; something that appealed to them. We took that feedback back and shared it with our designers, and they’ve come up with what they’ve created today. Young people wanted the website to be something positive. They felt other websites have images of young people looking very sad and withdrawn, this was something that they didn’t want. They wanted something that showed positivity, friendly happy faces of real young people, not typical model like people that they could relate to as well. We really took that to heart and made sure that any images that we had on the website were of a positive nature. They said they would like to see video case studies and there were some volunteers keen to participate in them, which I’m sure my colleagues will pick up as time progresses. I know that it’s more than just information giving. What else does the website do? Information is a key part. A lot of it is about improving understanding. But, it’s about acknowledging the staff as well. 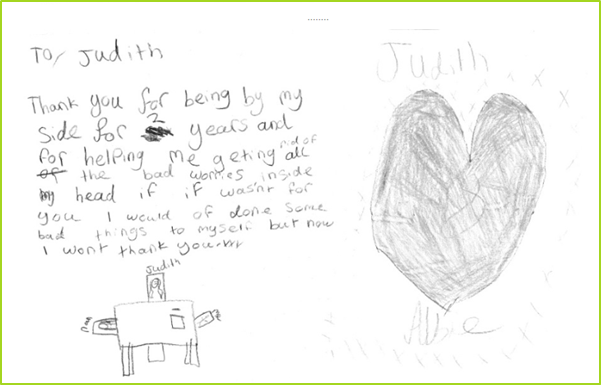 We have a testimonial section which is an opportunity for service users and parents, to show their appreciation to members of staff, clinicians, who have helped them to manage their emotional wellbeing and mental health. There is also information giving, in terms of the ‘Did you know?’ section which helps to break down the assumptions, and preconceived perceptions about mental health and emotional wellbeing in a fun an engaging way. There will be a whole wealth of case study information as well that will be really useful for young people to be aware of. Although it’s a website dedicated for young people, there is also some information for parents and professionals such as teachers as well. Are other services signposted on there? Oh yes of course. 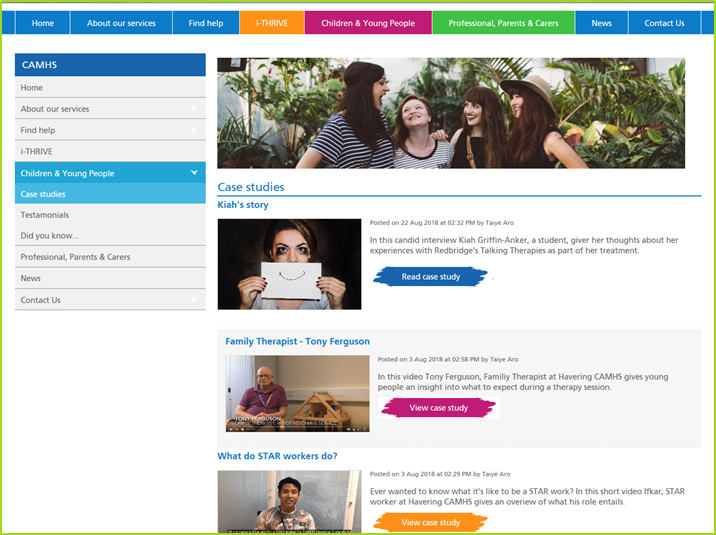 The great thing about this website is that, in NELFT, well in CAMHS, we are across four localities. That’s Havering, Barking and Dagenham, Redbridge and Waltham Forest. In this website we have managed to tailor the services via each geographical area so if a young person lives in Barking and Dagenham for example, there is a dedicated space for Barking and Dagenham on the website. They can find out about members of staff that make up the service, but also the support they can access within the local community. If they go onto what’s called the ‘Find help’ section they’ll be able to scroll down and find services within the community available to them broken down by age. We’ve got 0-5, 5-11, 11-18. If a young person has an eating disorder, is feeling anxious or depressed, or are experiencing troubles at home, there’s information that is available to them within the community that they could see. This bank of resources is going to be constantly updated with more information, with more services and organisations and we will be working together with other providers to help signpost to really useful information for young people to take advantage of. How does this link with THRIVE? The delivery of our mental health services is underpinned by the THRIVE principles. On the website, we wanted to make it really clear that this is the case, so we have included the THRIVE needs based groupings. It’s a case of communicating to young people about where they sit within those needs based groupings e.g. whether they’re receiving support within the Getting Advice needs based grouping, which is where the resource information would be great to signpost to or if they do need help, it provides that support mechanisms enabling them to actually get the help or support needed, whether it would be contacting us for advice, or to self-refer. So young people can self-refer through this website? Absolutely, yeah there’s a self-referral form. We have made that clear on most of the pages under the children and young people’s sections and there is also a ‘Contact us’ button. Do you access this through the main trust website? The link is www.nelft.nhs.uk/camhs. You just enter that in the search box and it’ll come up. You don’t need to go directly to the NELFT website. What kind of information is available for adults? As parents are the chief influencers of young people, it’s really important to have them engaged and informed. We’ve highlighted the Wellbeing Hub, which is the front door to services and it shows the integrated nature of all the different children’s services that are available. It’s there to reassure parents that there is an integrated effort when it comes to reducing health inequalities, ensuring that the different services are working together, and we’re not taking a siloed approach to one young person’s health and wellbeing. The resources can be relevant to the adults as well in terms of helping support the young people who visit these services. In addition, some of the services available are for parents as well. What’s next for the website? There’s going to be a second stage of the website. What we’re keen to do is always find ways we can increase the functionality, such as having a postcode search making it easier for young people to identify exactly which geographical area they’re located in, so they can easily be signposted to the relevant services in their area. There will also be a secure online referral form. We’ll be creating more case studies, especially case studies fronted by young people to help share their stories and dispel the myths of mental health services from a young person’s perspective. We will also be looking to develop the pages in consultation with the patient engagement groups, making sure that information is still relevant and clear. This is just the beginning – there are lots more exciting things to come to this website! I think this website has been a great example of loads of different people, from different walks of life coming together collaboratively to produce something that meets the needs of young people. Through stakeholder engagement events we’ve reached out to teachers, parents, professionals and all have had a part to play in developing this website. This is just the start with sustainability ensured through secured financial resource to support future developments. This is something that will continue to go from strength to strength.